Discussion in 'First Time Marijuana Growers' started by PHATTMANN, Apr 23, 2010.
yeah like he said above not until they are amber. 45 seed and one plant..... she must be the chosen one. you should have cloned that female and kept a male, harvested the pollen and pollenated the female clone cos there some old genetics! You still have a few weeks, maybe a month to go. You'll really start packing on the weight soon though. 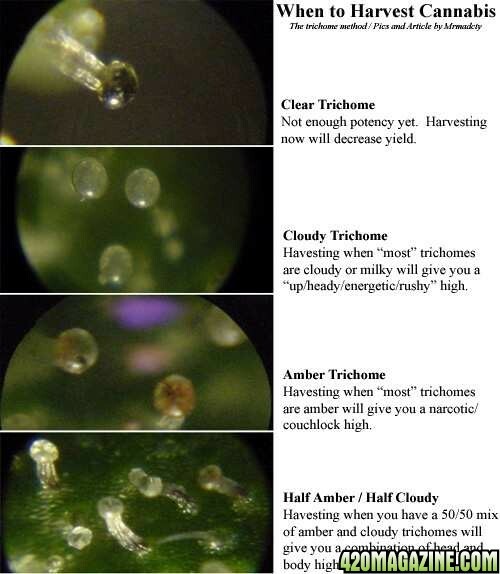 I suggest getting a jeweler's scope or a strong magnifyer so you can harvest by looking at your trichromes, or the little chrystals, sugar, frost, w/e you want to call them. Yet Another "Is it Done Yet?" thread.